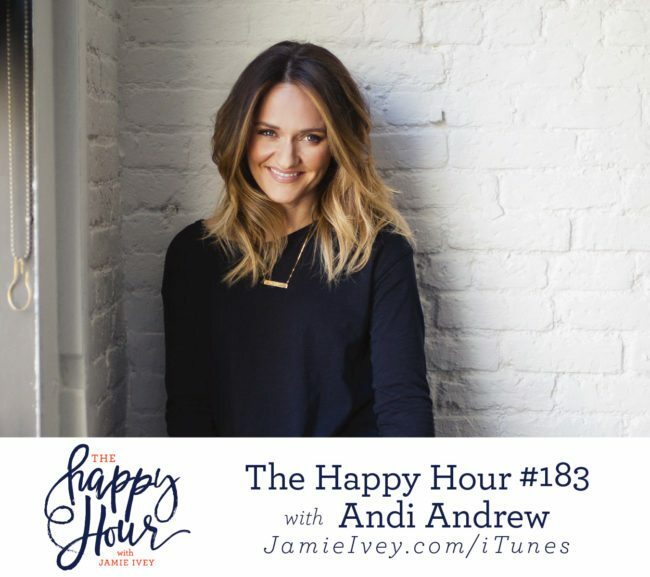 My guest for The Happy Hour # 183 is Andi Andrew. Andi is the author of She Is Free, and cofounder and copastor with her husband, Paul, of Liberty Church. In 2015 she launched the She Is Free Conference in order to equip and activate women to walk in freedom, spirit, soul, and body, and see others set free in their sphere of influence. A frequent speaker all over the world, she lives in Brooklyn with her husband, Paul, and their four children. You guys, I am so excited to share with you my conversation with Andi. Her message of freedom and replacing lies with truth aligns so much with what I am passionate about. We cover so many topics from the lessons learned from sharing rooms with your siblings, to how the lies we believe will alter our perspective on the world. Andi also shares her story of moving to Australia where she unexpectedly met and married her husband, and the amazing story of how God led her and Paul to start Liberty Church in NYC. We then dive into the lies we cling to that disconnect us from God and each other. Shame, anger, control - do those sound as familiar to you as they did for me? Andi and I talk honestly about how these can manifest in our own lives and how we can work to dismantle the lies and live in the truth. One note about our conversation today: Andi and I do talk about some mature topics related to marriage, so you may want to be aware of little ears that are listening.